What would you do if you wanted your widgets arranged in a tabular structures? For example: a list of labels followed by input fields. Well, you would divide your window and other widgets into grid, and would justify the contents of grids right, left, up, down, etc. You can choose the location of your widget in its parent widget, by adding the ‘grid’ method in the block following the ‘new’ method. 'sticky'=>'e' means justifying right. e=east, w=west, ne=northeast, etc. 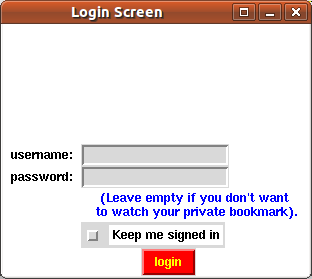 pixels between the text 'username' and the input field. and will result in a program that does not respond!